Because I’m so focused on my garden, children and friends often give me garden ornaments for gifts. 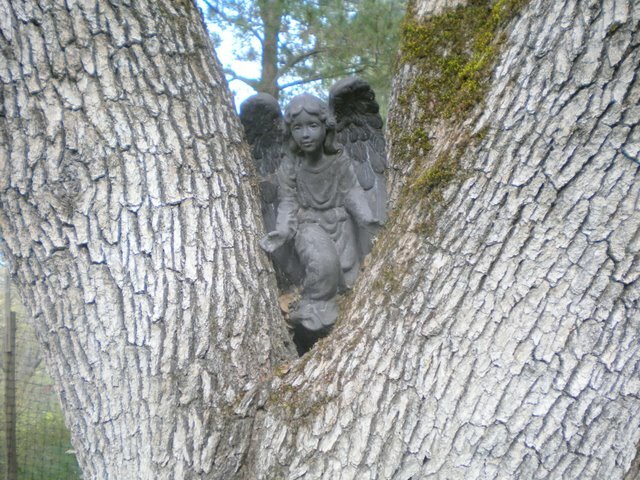 I can’t actually recall just why I did this, but I took an angel who seemed to blend the perfect woodsy grey into the bark of the Blue Oaks that abound here on Castenada Lane, and put it in the crook of the oak’s branches. 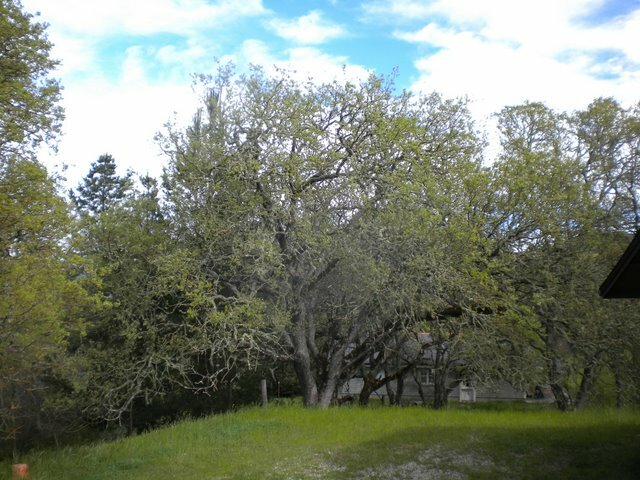 There are quite a few oaks on the three acres, mostly Blue (Quercus douglasii), some Valley (Quercus lobata), the Interior Live Oak (Quercus wislizenii) and even two examples of the evergreen California Scrub Oak (Quercus dumosa). The tree I selected not only had the perfect cradled crook but, and this may seem preposterous, it was simply my favorite of all. 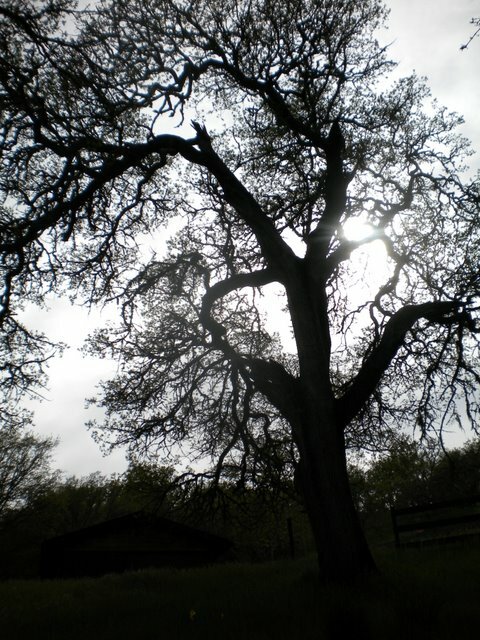 It was the Mother Tree. And right across from it – the one I call The Magus. It is old and wizened and magic all right and the deep pockets in it’s trunk give our Acorn Woodpeckers the finest hidey holes imaginable. The Angel Tree became a ritual for our granddaughters, Cassidy Rose and Haley Marie. I would tell them they had to search all over, take their time, be very selective, find just the right and perfect spiritual offering for the angel. It may be a flower petal, a rock that catches their eye, a discarded bird feather, something that “speaks” to them in a magical sense. And then, they could visit the Angel Tree, make the pilgrimage up the hill, present their offering and make a wish. I have to admit I occasionally make my own sojourns when they’re not around. I was raised with Angels all around, literally and figuratively. My Mom always collected angels – figurines and pictures – from the time I was little. As a girl I gave them names, scrawling with pencil on the bottom of each, often fanciful, usually ending in “el” as I thought was appropriate. When Harriet died on the last day of July 2010, we said “she passed away peacefully at home with her beloved collection of angels, looking down from every surface, nook and cranny” so that one might truly believe in and experience the reality of Shakespeare’s phrase “…and flights of angels sing thee to thy rest.” On many levels I believe that was true of Mom. Harriet didn’t just “collect” angels, she believed in them. We always ask the angels, my daughter Noelle and I, for that is what Harriet taught us to do. After a distressing automobile accident – not my fault – but involving a pedestrian, I felt so uncomfortable behind the wheel for a time that I created two guardian “car angels” who I named Zepheriel and Mercuriel (always the “els”). I imagined that they were lesser, “in-training” angels who were always really excited to sit above the car in inclement weather, actually relishing the excitement of the wind and the rain, and loved to experience new venues – even the dreaded L.A. freeways, so they would always keep me safe, even there. In this way I eased myself back into a semblance of comfort behind the wheel. Mara, my good friend, laughed at me and wondered why it was I felt I was only worthy of the “trainees”. Well, good point. I guess we’re all deserving of the “biggies”, the ARCH’s, but I do still like my guys. And I even loan them out on occasion. My own angel collection consists of just one large picture which is actually a photograph in black and white, showing the lower half of a being, swathed in gauzy white, falling down through space. It’s called “Angel Descending”. Hard to describe in words the beauty and the peace I see in that photo. It reminds me of the idea of the Bodhisattva, who finally becomes an enlightened being, and as the story goes, just as he/she is ready to step off the last rung of the ladder to heaven having earned his wings and his divinity, pauses and turns around to help all those behind them. There’s a concept we need more of in this world. Our favorite film, maybe of all time, is by Wim Wenders, a German director. It’s called “Wings of Desire” and tells the story of an angel, previously one of the guardian “watchers” who simply lend their unseen presence to humans going about daily business, but who eventually chooses to give up his divinity and become a man. He’s like the Bodhisattva. So Harriet gave me a sense and appreciation for angels in our lives. And just recently, when ventricular tachicardia began to be a bit too worrisome and problematic, I actually placed a wish for health by that very photo of the Angel Descending along with the first white flowers of spring from the garden and a candle. Next week, after the procedure is complete, I’m going to take the flowers to the Angel Tree. I really loved this about the angels, your mom give me them too, when I visited her. Thanks for another great story!